Fuel Ethanol Workshop & Expo come to a successful close at Omaha convention center in Nebraska, USA on 11th June. The workshop had the greatest impact on the new technology and operation of the most advanced production of fuel ethanol. The top raw material handling companies, ingredient suppliers and equipment suppliers from all over the world came for the workshop and many of them were interesting in the current development of 2nd Fuel Ethanol. U.S. is the largest producer of Fuel Ethanol in the world and produces about 33% of fuel ethanol of the world yield currently. According to the U.S. department of energy's plan, 75% of oil imported from the Middle East will be replaced by biofuels made from renewable materials on 2025. Moreover, 30% of current gas use will be also replaced by biofuels on 2030. The U.S. government has encouraged further development of fuel ethanol and has planned to increase the amount of fuel ethanol added from 10% to 15%. Also, the large oil companies were restrained by legislation on adding fuel ethanol on demand and tried to distribute profits to others ethanol farmers and industries. Therefore, Fuel Ethanol is going to be a huge market. We show our products such as Acid Protease, Glucoamylase, High-temperature alpha-amylase, High-temperature alpha-amylase, Low-temperature α-amylase, Neutral Protease, Pectinase, Pullulanase, Xylanase and so on. Sunson become a highlight in the same field, it had a well preparation with comprehensive technical services, high-performance alcohol enzyme series products for customers. Moreover, the innovative design and precise market positioning have attracted a lot of foreign merchants to watch and consult our products. In the workshop, Sunson`s high-quality engineers provided some technical guidance and scheme optimization to solve many technical problems of alcoholic enzyme from purchasers. Therefore, many of those purchasers were satisfied with us and the purchase intention was reached on site. This is an industry feast, but also a harvest journey. All the samples of alcohol enzyme from Sunson were snapped up by merchants and we also got a lot of valuable opinions from them. 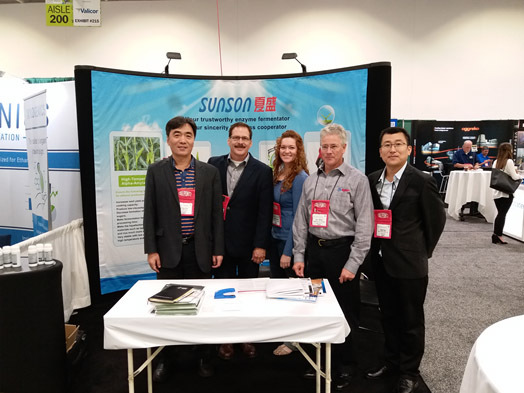 In the recent years, Sunson has achieved a long-term development in the enzyme products and achieved many remarkable successes by certain brand accumulation and stable product development. We have become a major player in the field of Alcohol Enzymes by great marketing skills. Nevertheless, there is a long way to go and we will improve the management system constantly to speed up the brand building process of Sunson. Furthermore, we will provide more high-quality enzyme products to our new and old friends.